Today. the 5th graders at Oakdale went on a field trip. I chose the right one to chaparone. 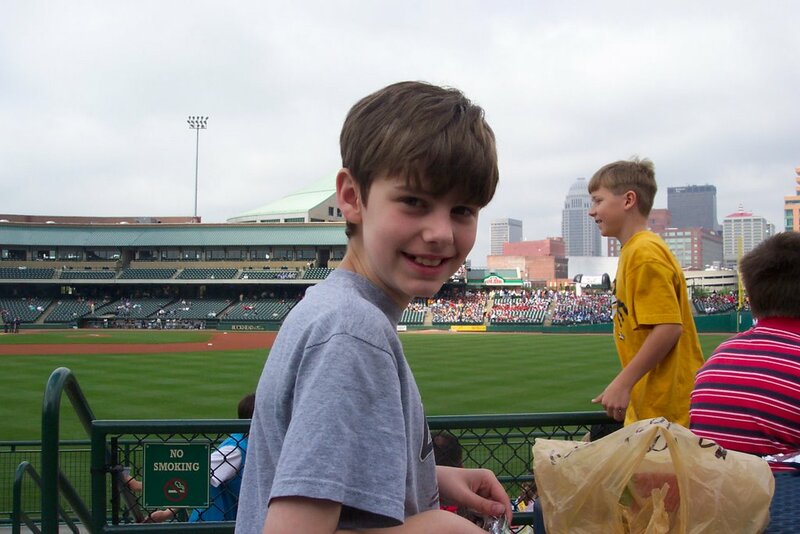 This was a great day for some baseball. we had to be at school by 6:45 this morning. Charter busses arrived at 7:00 and we were on our way to Louisville Kentucky. Our first stop was the Louisville Slugger Museum and Factory. What a great tour. A very nice tour of the factory where they mak about 1,500 bats each day. 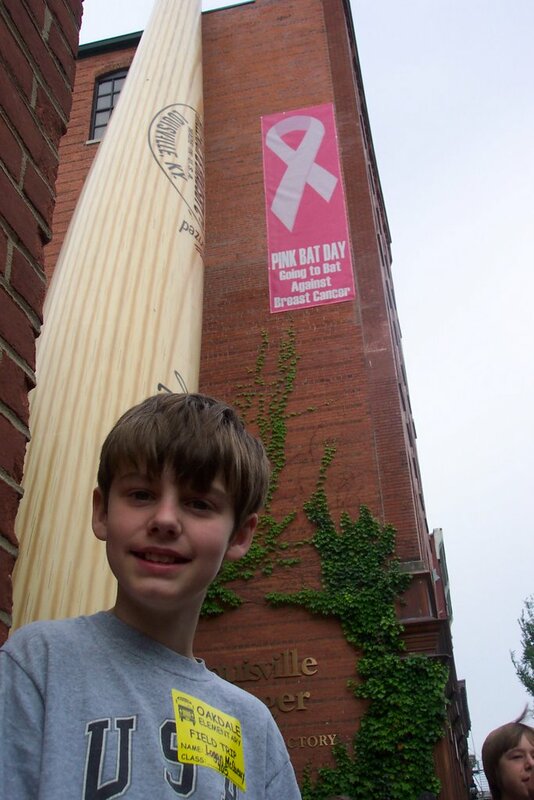 this picture of Logan is just outside where a replica of a Louisville Slugger towers about six stories high. It takes a special place to craft the Official Bat of Major League Baseball. Since 1884, Louisville Slugger has put prime lumber in the hands of the greatest players of the game. 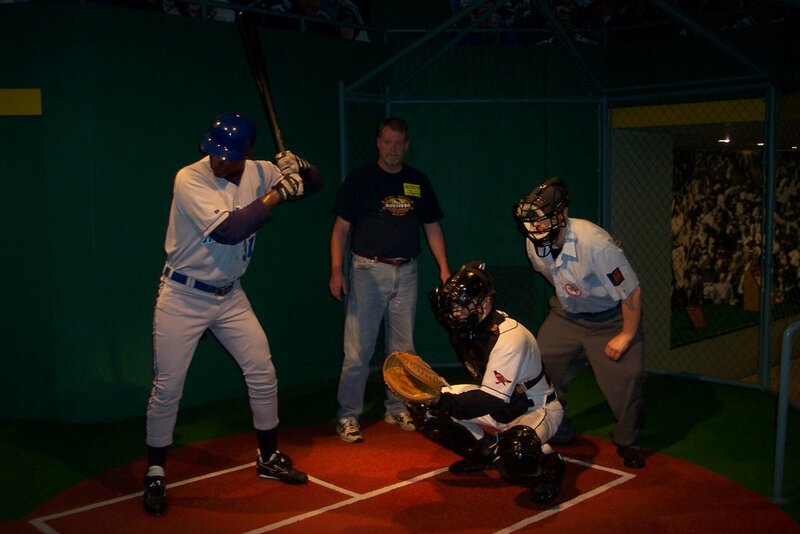 A visit to the museum shows you how the sport has changed a bit between then and now, but the "crack of the bat" remains one of the sporting world's most thrilling moments. As most of you know, I like to sell on eBay. On loan to the museum was a bat used by Babe Ruth, signed the day he hit his last home run as a Yankee. I say on loan because this item was found in a closet, packed away for decades and forgotten. The owner plans to sell it some day to pay for their kids education. In Major League Baseball, Louisville Slugger bats are used by over 60 percent of all Major League Players, including the game's best hitters like Ken Griffey, Jr., Tony Gwynn, and Derek Jeter. Compared to the great sluggers of yesteryear, today's pros use more lightweight bats with thinner handles. Approximately 30 percent of the players using Louisville Slugger bats have the bats cup balanced, which means up to three-quarters of an ounce of wood is scooped out of the end of the barrel, also making the bat lighter. Lighter bats help today's pros swing faster and send the ball further. Most bats today are made from northern white ash, but a growing percentage of professional players, currently about 40 percent, have started requesting bats made out of maple. During the factory tour, I asked at what stage in the process they added the cork.......the tour guide was not amused. We continued our field trip to Louisville Slugger Field. Louisville Slugger Field, home of the Louisville Bats, the Triple-A affiliate of the Cincinnati Reds, is one of the most exciting and attractive sites in minor league baseball. 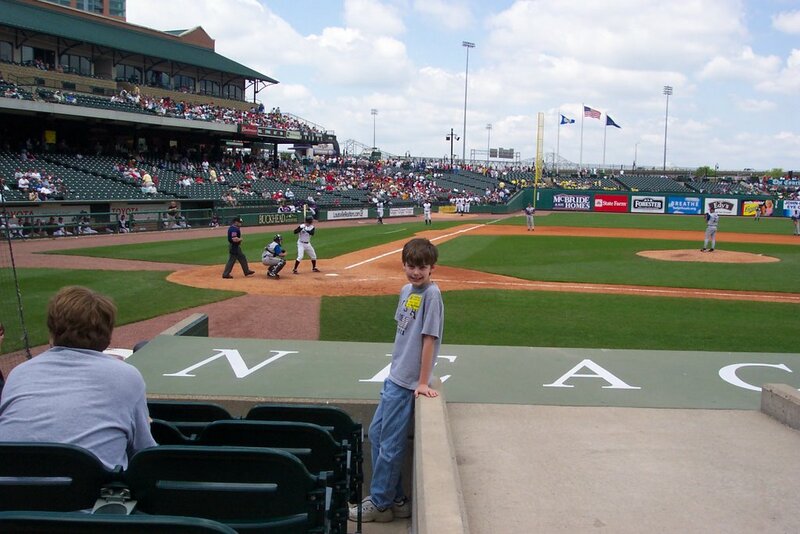 Named after the popular Louisville Slugger baseball bat, the stadium offers something for fans of all ages. 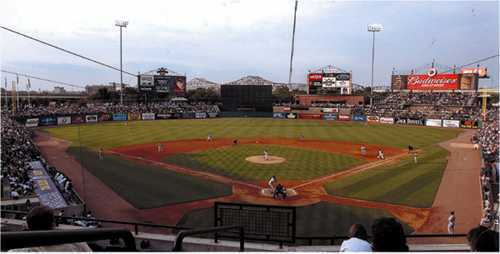 With its retro-classic design, Slugger Field has quickly become one of the most admired parks in all of baseball. I have to say, this minor league, familiy friendly ballpark, game and extras made for a delightful day. Admission is very reasonable and prices inside are affordable. This is a Day Trip that the McQuearyClan will do again. 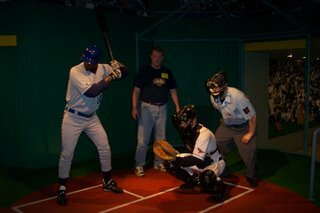 I have always wanted to go to the Slugger Museum. Sounds really fun. Great pics. Your kids are very photogenic.